Tapas dining means sharing with friends. In a relaxed space. Probably in the shade on a hot sunny day. Reminding locals of great holidays in the Iberian Peninsula, they have taken to tapas with gusto. Skewers of king prawn and grilled garlic chicken go down very well. Baked sliced potato in creamy cheese sauce, and chorizo sausage prepared in more ways that you can shake an empty plate at simply sizzle with garlic. If you like lamb, goats cheese with Seville orange just and the like, you'll be in a Glaswegian tapas dream when you give the local tapas restaurants a try. So slap on that sun-cream, don your shades and mix up some Sangria... and off we go! Great news! 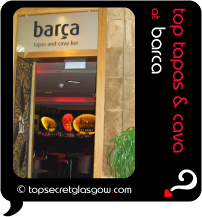 Finding this page means you can now join our VIP list for EAT Tapas. Time to grab your very own page for EAT Tapas. Do you have a special story about a time you decided to EAT Tapas? A funny experience? A grand occasion? A funky photo? A personal tip? A top secret?